Is this a dip to buy? GE reached new 2019 highs on Tuesday as its post earnings(1/31) breakout began to show signs of exhaustion. Shares have been drifting since leaving behind a downside reversal that day. 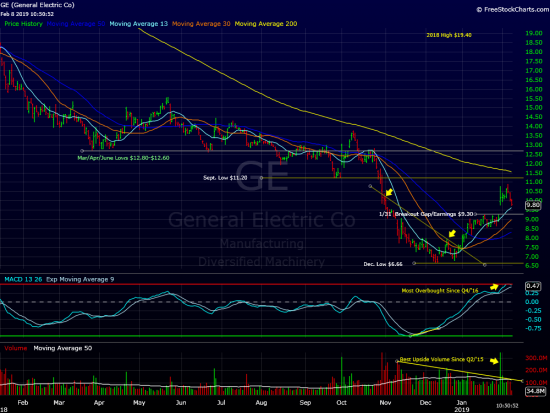 GE will soon fill the powerful earnings driven breakout gap. The stock finished with an 11% gain that day after gaining as much as 16% in the early going. Volume diving this big move was very heavy, the biggest upside day since mid 2015. If volume continues to ease as GE drifts lower we believe a gap fill move($9.30) will present a very low risk entry opportunity for patient investors. On the downside, a close below $8.60 would violate last week’s low sending a clear warning sign that the post earnings momentum has been wiped out. At time of publication we are long GE in some managed accounts.